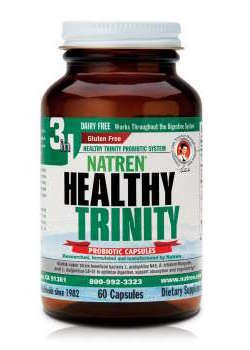 Healthy Trinity provides 30 billion colony forming units (cfu) of effective beneficial bacteria per capsule to enhance digestion, improve nutrient absorption, stimulate proper elimination and maximize your immune function. These exceptional probiotic super strains are also found in Natren's Healthy Start System of powders or capsules and, individually, in Megadophilus, Bifido Factor and Digesta-Lac. The guaranteed potency and benefits of Natren's super strains are not available from any other probiotic in the world. Only Natren uses a unique oil matrix system that micro-enrobes three super strains of beneficial bacteria, keeping them separated, noncompetitive and protected from the stomach's gastric juices. 60 Capsules in brown glass jar. Ships 2nd Day Air with insulation and ice pack. 100% potency guaranteed through the printed expiration date when stored according to the label instructions.